In general, every category is expected to see a modest increase. At the top of the list however, is virtualization. 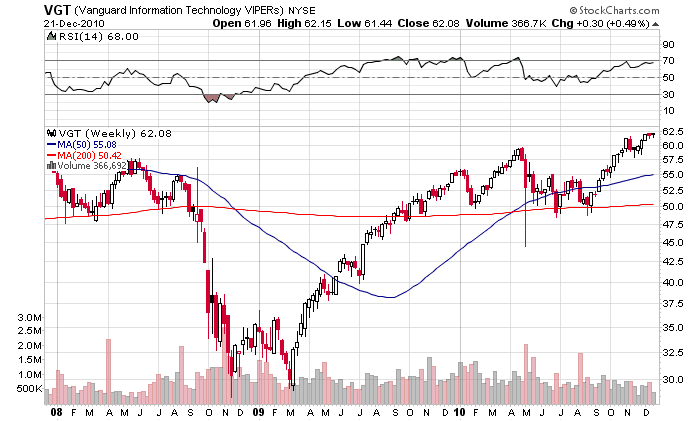 That suggests VMWare (VMW) should have a good year in 2011 as they are the leaders in the virtualization field. The next category, data center infrastructure hardware, is much more varied in terms of the players. Companies including IBM, Dell, HP and recently Cisco are competing to supply servers. Cisco, Juniper, HP again and others are active in the networking sector. It becomes harder to determine a winner in this category. As a result, an investor might want to consider one of the hardware focused ETFs such as the Merrill Lynch Internet Architecture HOLDRs (IAH). Then there is a plethora of semiconductor companies that support all the hardware vendors mentioned above. There is a good choice of ETFs here including the iShares S&P GSTI Semiconductor Index Fund (IGW), PowerShares Dynamic Semiconductors Portfolio (PSI), SPDR S&P Semiconductor ETF (XSD) and Merrill Lynch Semiconductor HOLDRs (SMH). Back-office software is expected to improve and here we would expect to see continued strength in Oracle, currently the leading company in that sector; however, there are certainly many other players including Salesforce.com, Microsoft and SAP. Again there are several ETFs that cover the sector well including the iShares S&P GSTI Software Index Fund (IGV), Merrill Lynch Software HOLDRs (SWH) and PowerShares Dynamic Software Portfolio (PSJ). If you can't decide on a particular sector, there are always a number of broad technology ETFs, most of which have the advantage of trading large daily volumes. The most well known are the iShares Dow Jones U.S. Technology Sector Index Fund (IWY) and the Technology Select Sector SPDR Fund (XLK). Finally, if you want to truly focus on IT, there is the Vanguard Information Technology ETF (VGT). This ETF includes all the stocks listed above plus various outsourcing/consulting companies, a number of chip makers and even Apple (the ETF's largest holding), Mastercard and Visa. As the weekly chart below demonstrates, this ETF has performed quite well and is at 3-year highs. Based on the results of the Information Week survey, VGT has a good shot at hitting further highs next year. This should be one of those times where buying on a pullback could be a very good strategy.